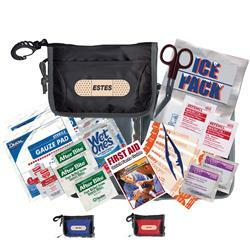 This first aid kit offers a great design with all of the items you will need for basic first aid. Ice pack, scissors & tweezers come standard. Includes: 1 Ice Pack, 1 Scissors, 2 Wet Ones Antibacterial Wipes, 2 Antiseptic Swabs, 3 After Bite Itch Erasers, 2 Alcohol Pads, 1 First Aid Quick Card, 1 Tweezer, 2 First Aid Burn Ointments, 2 - 3"x3" Sterile Gauze Pads , 5 Bandage Strips. 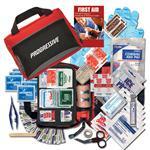 Remember, we can custom fill any first aid kit with what you need! Just call or let us know the fills that you require and we can make it happen! Available Colors: Royal Blue, Red, Black with trim. Typical Imprint Area(s): 3.5" X 2.75"
Includes: 1 Ice Pack, 1 Scissors, 2 Wet Ones Antibacterial Wipes, 2 Antiseptic Swabs, 3 After Bite Itch Erasers, 2 Alcohol Pads, 1 First Aid Quick Card, 1 Tweezer, 2 First Aid Burn Ointments, 2 - 3"x3" Sterile Gauze Pads , 5 Bandage Strips. 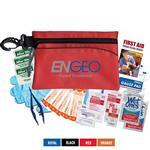 Custom first aid kit fills available - please inquire for pricing.